[398 Pages Report] The North American crop protection chemicals market covers various types of products being used in the farms to safeguard the crops, by controlling the population of organisms considered harmful or those that can potentially damage or adversely affect the growth of crops. Crop protection chemicals are mainly divided into herbicides, insecticides and fungicides. Pesticides include both synthetic pesticides and bio-based pesticides, are the largest market segment owing to their wide-spread use in bulk quantities. Adjuvants are essentially pharmacological or immunological agents used to modify or enhance the effect of other vaccines and drugs. Insecticides are widely used because insects and parasites cause maximum damage to the crops during cultivation. Insecticides are used in large volume and they show their action for a longer period of time as compared to others. But excessive use of any pesticide results in the development of chemical toxicity for humans, animals, and environment owing to soil leaching and water contamination. Overall, it is essential to use crop protection pesticides in appropriate quantity and time to minimize their adverse effects and to bring to maximum benefits. The North and Latin American crop protection chemicals market, in terms of active ingredient volume was estimated at 1,064.1 KT in 2011 and is expected to reach 1,322.5 KT by 2018. The North American crop protection chemicals market has been divided into patented and generic pesticides. Almost over 67% of the market share belongs to patented or proprietary active ingredients, while 33% of this market is generic. The proprietary pesticides market has been built with a strong focus on North American crop protection chemicals based on stringent regulations, driven by the U.S. and European standards. In such situation, most of the major global players are focusing to slim down their production capacity of low-revenue ($million) off-patent proprietary products. The basic notion behind taking patents for the agrochemicals is to encourage innovation akin to the pharmaceutical industry as well as to get rid off the problem of piracy and counterfeit products. Moving forward, many molecules are likely to become free from patent and become open for generic players. This report estimates the market size of the global, North and Latin American crop protection chemicals market both in terms of active ingredient volume as well as revenue. The market has been further segmented on the basis of crop types such as cereals, grains, oilseeds, and vegetables as well as by sub-segmentation of insecticides, fungicides, and herbicides such as glyphosate, atrazine, and 2,4-D. This segmentation is given for major regions and key countries in those regions. Market drivers, restraints and challenges, raw material, and product price trends are discussed in detail. Market share by participants for the overall market is discussed in detail in the report. We have also profiled leading players of this industry including Bayer CropScience (Germany), BASF (Germany), Monsanto (U.S.), and Dow Agrosciences (U.S.). North America has traditionally been a high consumer of crop protection chemicals. However, in recent years, regulatory framework, controlled by the EPA and USDA has become highly stringent on the registration and commercialization of pesticides. Owing to the growing demand for animal feed and increasing use of corn for renewable chemicals and bio-fuels, arable land has been decreasing since 2005. Latin America is the emerging agricultural powerhouse, growing at a rapid pace above the global growth average. Growth in this region is significantly contributed by the growth in Brazil and Argentina, which are the worlds most potent agricultural producers and is expected to grow well above the regional average. The North and Latin American crop protection chemicals market, in terms of active ingredient volume was estimated at 1,064.1 KT in 2011 and is expected to reach 1,322.5 KT by 2018. Growth in revenue is expected to be higher than volume, owing to the increasing cost of pesticides. U.S. is the most dominant market in North America, accounting for over 80% of the total North American crop protection chemicals demand in 2010. Due to the expansion of farmlands and increasing use of pesticides, crop protection chemicals market in Brazil is moving at a rapid pace to become the most desirable growth market for crop protection chemical companies. 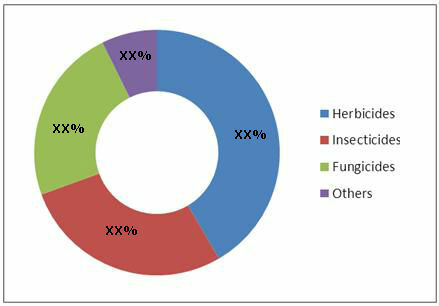 North America Crop protection chemicals market dominates the global herbicide market and has the largest market share in terms of volume and revenue. Europe is the second largest market for herbicides. North America is a mature market and is dominated by a few major players. To survive intense competition, companies in this region are focused on new product development.